These days, the market is full of all kinds of GPS tracking devices. Whether you want to know that your kid arrived home safe, or you want to track your wandering pet, these little gadgets prove to be very useful. They allow you to easily track your important essentials, vehicles, or loved ones. With tracking devices you can relax knowing that all your belongings are in a safe place. If any of your precious things get removed from their place or even stolen, you’ll be first to know! Using a tracking device will allow you to track your luggage in the crowded airport in a matter of seconds, or report the location of your stolen vehicle with great accuracy. However, choosing a proper device for your needs isn’t as easy as it looks like. There are so many different devices and features that make this simple task very complicated. That’s where we step in! 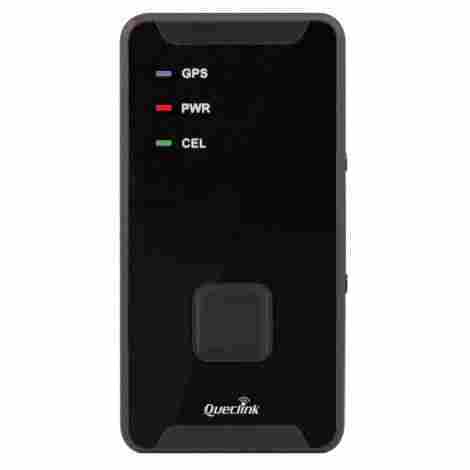 We provided a list of 10 best GPS tracking devices we could find on the market. Hopefully, the list will help you find just the perfect tracker for your needs! Spy Tec is probably the most popular option on the market! It comes with some seriously good features and offers a high level of accuracy. No matter what you are tracking or where it turns to be, Spy Tec will let you know the exact location in a matter of seconds. This little, yet powerful, device offers excellent performance whether you want to track people, vehicles or other kinds of stuff. The Spy Tec allows you to track your things or beloved ones with high accuracy and without too much effort. When it comes to startup, things are pretty easy as the device becomes active immediately. You can track the location of the object from your phone or computer, or any other device that connects to the Spy Tec website. The website lets you decide how you want to track a certain object. For example, you can mark a specific place on the map and get notified when the object leaves that area. Pretty cool, right? We should only warn you that battery life isn’t so great as the manufacturer claims – the description says that the battery lasts up to 2 weeks, but it turns to be less powerful than that. The device will turn on sleeping mode when not in the move though, so it will save some power and work longer. However, don’t expect more than a week of continuous tracking in the best case scenario. Spy Tec weighs only 2 ounces and it measures 3 inches in length. Its compact design allows for easy attachment and carrying, whether you’re using it yourself or to track other people. Nobody will notice such a small tracking device! You can put it in your backpack or luggage to make sure that your stuff doesn’t get lost on the airport, or you can attach it to a vehicle you want to track. The possibilities are endless with Spy Tec. We would only like to see this device paired up with a phone app. It would significantly improve the user-friendly experience. Overall, Spy Tec is a super useful tracking device that offers excellent performance and durability. It’s also one of the cheapest tracking devices on the market. The only thing that comes as an issue is an expensive fee structure – if you want to have faster location updates, you’ll have to pay for more. You can track the device every minute or every five seconds, depending on how much cash you’re willing to spend. Truth to be told, most people don’t need quick updates. If you don’t intend on tracking a lot of cars, you’ll be satisfied with custom location updates. Whistle 3 is one of the best tracking devices for pet parents! It offers outstanding accuracy in detecting your pet’s movements and locations, and it features some great options for advanced tracking. With Whistle 3 you finally get to know all about your pet’s secret life! This tracker allows you to track your pet whenever it leaves the safe area. With Whistle 3 you’ll be informed about your pet’s movements almost every second. Set the notification options according to your preferences and get a text message, app notifications or emails when you’re pet is out of the safe area. You can mark several safe areas on the map, you just need a Wi-FI connection to do so. The device will also give you a full review of your pet’s movements in the last 24 hours. You can use it to set a daily activity goal for your pet. Just set its age, weight, and breed, and the device will calculate how much activity your pet needs. It basically works like a calorie counter app for humans, where we add the food eaten for the day as well as our physical activities. The only thing that proves to be an issue with this device is a certain lag that occurs when a pet leaves the safe zone for the first time. Many users complained about not getting the first notification for the movement, although Whistle worked perfectly later on. Whistle 3 is a small device that attaches to your pet’s collar. It measures 1.45 x 1.82 x 0.61 inches and weighs only 0.96 ounces. The compact design makes it suitable for pets heavier than eight pounds – it’s a bit bulky on kittens, but it looks really tiny on big dogs. When it comes to durability, Whistle 3 has an IP67 rating which means that it’s dirt, shock, and water resistant. Without this kind of protection, it couldn’t stand a day in a pet’s life. The battery should last up to 7 days, and the good thing is that Whistle has a power save mode which will stop tracking your pet when it connects to the home’s WI-FI network. This significantly prolongs the battery life. You’ll also get a notification if the battery is running low and you need to charge it. Don’t worry, it will be fully recharged within 2 hours. 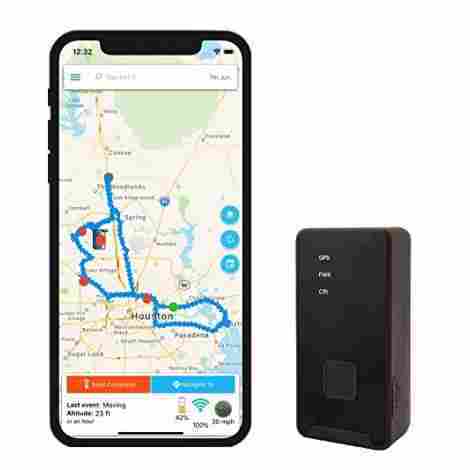 While we can say that a high-quality GPS tracking device like Whistle 3 is reasonably priced, you should keep in mind that it requires a subscription plan to connect to the phone app. There are, however, various subscription plans that you can choose from if you want to save some cash. Considering its overall performance and quality, it’s definitely worth it. Americaloc offers a first-class GPS tracking device that will help you track all your precious stuff and beloved ones. This compactly designed tracker comes with a variety of features and options, allowing you to track people and objects with great accuracy. You’ll have all the necessary information quickly and without too much effort! Here we have an improved version of the popular GL300W. You can use it to track people and objects with great accuracy. The setup process is quite easy. After you place the tracker you need to start the app from your phone, tablet, or computer, and that’s about it. You get to decide how quickly you want a location update and how you want to be alerted about it. The device also records all locations tracked in the previous year, so you can review them whenever you want. The only issue comes from obstacles such as walls and roofs that could obstruct the signal, and cause some annoying lag. The manufacturer should seriously improve this in the future. The device measures 2.7 x 1.51 x 0.92 inches and it weighs 2.3 ounces. It’s not small enough for pets’ collars, but it’s very portable and doesn’t drag too much attention. People mostly use it to track cars and pieces of luggage, but it can be used in a handful of situations. Another great thing about this tracker is the long battery life. Americaloc has many battery modes that should prolong its durability, allowing you to use the device up to 2 weeks and more. While this device is not the cheapest one out there, it does offer free configurations so you can get more location updates every 30 or 10 seconds. There are no additional fees, not even cancellation ones, and you’ll even get a 1-year warranty for the product. The Optimus 2.0 is a simple-to-use device that offers great accuracy and many tracking options. You can use it in different situations and for many purposes due to its compact and straightforward design. If you’re tired of all complicated tech stuff and want a no-nonsense device with excellent performance, there’s no better choice than Optimus! Optimus works as a real-time tracking device that allows you to read its location from your phone or your computer. You’ll get push notifications, text messager or emails when the device starts moving or speeding up, or when the battery is getting low. There is an SOS button as well. Additionally, you get to set a “safe area”, so the app will notify you when the device leaves a place you marked on the map. The best thing about Optimus 2 is the user-friendly experience it provides. 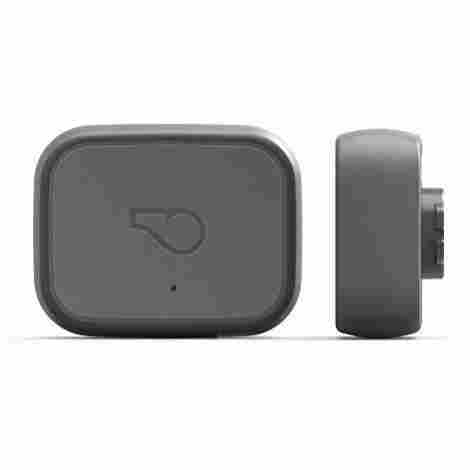 Everybody can use this GPS tracker – it offers simple setup, great portability, and comes with a free app. It measures only 1 x 1.5 x 2 inches and weighs around 3 ounces. While it is a bit heavy, the device is still very compact and practical. Additionally, it has a waterproof surrounding that doesn’t require an additional protective casing. Optimus 2 comes at an attractive price, but we find the monthly service a bit expensive. Overall, you should be very satisfied with the provided value for the money, but those who are on a limited budget might want to search for another product. Also, you’ll need to pay some extra cash if you want to increase location update from every 30 seconds to every 10 seconds. We all want to know the whereabouts of our vehicles for many reasons. 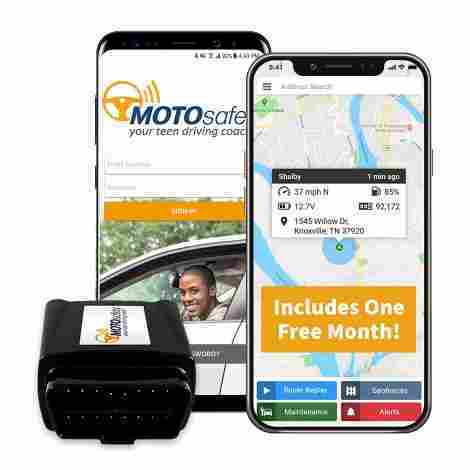 Having a teenage driver in the family is definitely one of the main reasons to search for GPS tracker like Motosafety OBD. This device tracks the exact location of your vehicle, marks the driving routes every day as well as speeding and harsh braking. As we already said, it’s a perfect driving coach for a young driver! 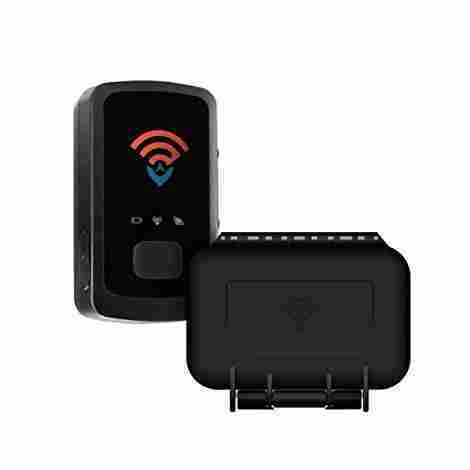 This GPS tracker is not only able to track the location of your vehicle, but it also detects speeding and harsh braking. You’ll get to see the exact driving habits of your child when you’re not around. Thanks to Google Maps, you can see the location of your vehicle from any place. You just need to connect to the app and adjust the options so you can get emails or text message notifications. It will also notify you when the vehicle enters or leaves the "safe zone" or if it is active past the curfew. The device measures only 1 x 1.8 x 2.1 inches and it weighs around 2 ounces. It easily plugs into the OBDII port located under the dashboard and doesn't require recharges like battery-powered trackers. If you decide to tell your kid about the tracking device, there is a driver’s report card that comes very useful. You can review your child’s driving route and write down all the received points for (un)safe driving. We have to address only one annoying and time-consuming issue. This device uses Google Maps that don't provide accurate speed limits for all areas. Therefore, the results and alerts could turn out inaccurate when it comes to speeding. You can manually enter the speeds of the particular area, but it will take you a lot of time. Also, even if you have memorized all the speed limitations in the city, the app will forget them for the next day. While many parents are praising this device because of its excellent performance and efficiency, some of them find it very expensive. Actually, the device itself is very cheap, but the monthly tracking fee will cost you an arm and a leg. Vyncs is a car option that allows exceptional performance at a budget-friendly price. It’s not only useful for tracking your car locations but for tracking speeding, harsh braking or cornering, and many other driving activities. There are a variety of useful features that come with Vyncs tracker, and they will make you love your new GPS device! The device comes with a variety of useful features such as maintenance reminders, optional roadside assistance, and vehicle diagnostics. Vyncs will not only track a location of a certain vehicle, but it will also provide additional tracking options such as speeding, harsh braking or cornering, and rapid acceleration. It saves the routes so you can review them later on and see the exact location of every traffic violation that occurred during the ride. There’s also a speeding histogram that will let you know how much time the driver spent in different speed zones. The device comes in 2.2 x 1.7 x 0.7 inches and it weighs only 0.8 ounces. It attaches to the car’s OBDII port, which is quite convenient because you don’t have to keep track of the drained battery. The setup process is a child’s play thanks to the straightforward website interface and user-friendly phone app. The only issue worth mentioning is a location lag, but that occurs with almost any GPS tracker. The best thing about the Vyncs is the free monthly service. 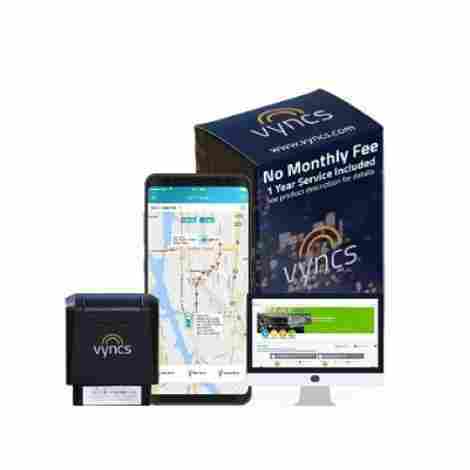 If you’re on a tight budget and you need a decent GPS tracker, Vyncs offers outstanding value for the money. However, there is a catch – the location update comes every 3 minutes, so if you want to get updates faster than this, you’ll need to pay a few more bucks. Tracks locations, speeding, harsh braking, etc. 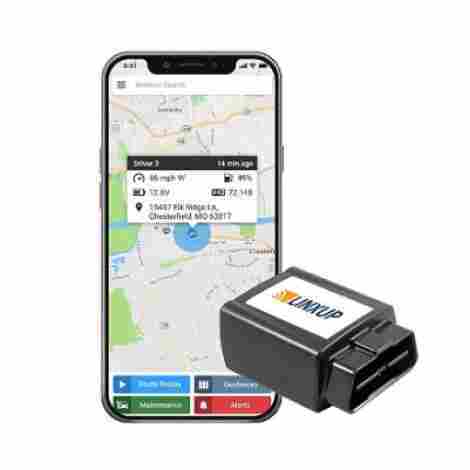 If you’re searching for a non-nonsense GPS tracking device that will let you know the location of your vehicle at any moment, Linxup is a perfect choice for you! It comes with some great futures and offers excellent performance over the years of use. Keep reading if you want to find more about this simple yet powerful device! Linxup offers accurate information about your car’s location and general movements. It will send you detailed reports that you can review later on, which is especially useful if you’re a parent that tracks a young driver. You’ll get to know all driving mistakes and teach your child to do better next time! You can also mark a certain area on the map and make the tracker alert you every time your vehicle enters and exits its boundaries. Linxup offers a simple-to-use device that requires only an OBDII port to start working. You’ll also need to install the proper app, but that should take only a few seconds of your time. Lastly, the tracker measures 1 x 1.8 x 2.1 inches and weighs around 2 ounces. It’s almost invisible for most people, especially because it goes under the dashboard. While the device itself is reasonably priced, the monthly fees are quite pricey. There are no cancellation fees, which is great but doesn’t make it less expensive. However, you’ll get a lifetime limited warranty and the support of amazing customer service. Detailed reports about the routes, movements, etc. Whether you want to track your luggage, vehicle, kids, or elderly family members, you’ll need an efficient tracking device that provides accurate locations in every given moment. Most people just don’t like to deal with complicated tech stuff, and they aim for a straightforward and simple design. If you are one of those people, Trak-4 might be a perfect choice for your needs! Trak-4 is a compactly designed option that will help you track all kinds of personal stuff, from vehicles and working equipment to your loved ones. It allows for simple installation and easy usage. You only need to attach or place it on a certain spot and connect to the provided website. You’ll get emails and text messages when this device leaves the marked area or when the battery is getting low, and you’ll be able to track it down on the map. Also, Trak-4 provides an approximate location when the signal is not available. This is very useful because the signal tends to disappear frequently inside parking garages and buildings, preventing GPS trackers to read accurate locations. The device measures 4.1 x 2.2 x 1.1 inches and weighs around 6 ounces. It’s a bit heavy, but not too much to influence the overall portability. You can attach it to your vehicle or put it in a bag, nobody will notice its presence. We especially liked the long-lasting battery that continuously works up to 18 months. Additionally, Trak-4 has a weatherproof casing, which means that you don’t have to buy additional protection for this device. Trak-4 has only one drawback – it doesn’t have a phone app. It connects to the website, which can be annoying and time-consuming when using a phone. Another small issue is the sticker on the casing. It is rather unnecessary and inconvenient, especially if you don’t want for anyone else to know about it. 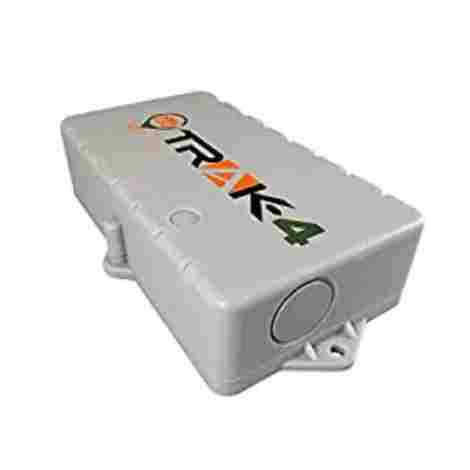 Trak-4 is a reasonably priced option that allows for simple and accurate location tracking. It does require a monthly subscription but it’s still cheaper than most of the trackers on the market. Even if you pay some extra cash to get quick location updates (15 min and 2 min), it will cost you less than regular monthly fees for other GPS trackers. Therefore, Trak-4 is a perfect choice for those who are on a limited budget and yet want to get a powerful location tracker. Here we have a highly portable GPS tracking device that will help you track all your belongings with great accuracy. From tracking pets, children, and spouses to tracking vehicles, luggage, and other important stuff, Amcrest proves to be a very efficient device. It comes with so many useful and cool features that will become one of your favorites tech gadgets! 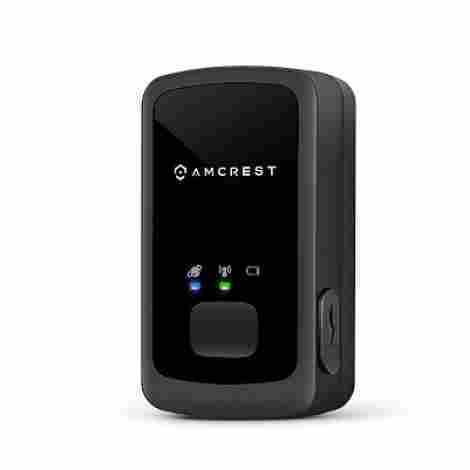 Amcrest GPS tracking device offers real-time tracking and greatly designed webpage and phone app. You’ll find an intuitive UI design very useful in tracking locations and reviewing routes and other driving activities. There’s a geo-fencing feature that allows you to mark the certain area so that you get alerted when the device enters or leaves the safe zone. Not to mention other useful features that track speeding, harsh braking, and other driving activities. You can adjust the app to send you text messages, push notifications or emails according to your preferences. The device is made of quality materials that are meant to last. The casing is water resistant, so you don’t have to purchase an additional protecting case. The battery should last up to 2 weeks of continuous tracking, which is also pretty impressive. However, we didn't like that the app doesn’t show battery life, and that website is not exactly straightforward. It actually demands a lot of clicks for simple operations. It’s nitpicking, but we would like to see the upgraded website and phone app. The device itself is reasonably priced, but the monthly fees are rather expensive. There are no contracts or cancellation fees, but if you want frequent location updates (60, 30, 15, or 5 seconds) you’ll have to pay good money for it. Here we have a perfect option for hikers and adventurers! 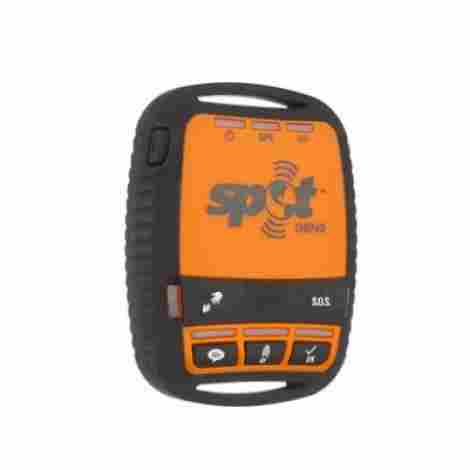 Spot 3 is a very useful device capable of enduring harsh weather and all kinds of impacts. It comes with a set of quality features that allow outstanding performance wherever you go. We are talking about a satellite-based tracker that will send your location every once in a while, allowing you to keep touch with the outside world and stay safe in every situation! The Spot 3 sends location updates whenever you move, and stops sending them when you stop moving. You can set it to send updates every 5, 10, 30, and 60 minutes according to the conditions you’re dealing at the given moment. For example, you can go for 5-minutes updates when the weather is really harsh, and change it later on when the dangerous situation pasts. There’s also an S. O. S. button that allows you to send your current location to the rescue team in the case of an emergency. As we already said above, one of the main advantages of this GPS tracker is the ability to endure harsh weather conditions and other tough situations. It has a rubber edge wrap all around the plastic exterior which protects the device from accidental falls and bumps. It also adds more protection to the waterproof design. Lastly, the battery life depends on how much you use the device, but it can last from 7 days to 156 days (60-minute intervals). The main drawback with this product is its sky-high price. While it’s worth every penny knowing you’re out there in the middle of nowhere with an efficient S.O.S. at your hand’s reach, some people just can’t afford this little gadget and get to enjoy its features. First and foremost, tracking devices have to provide accurate location readings. It’s just the thing that they are designed to do. We couldn’t forgive any lags or inconsistent tracking. That’s why the first products on our list are the best ones, providing exceptional value and accurate information. Along with the compact design of the gadget itself, we had to make sure that every product comes with an intuitive website or app interface. Many first-class trackers come with badly designed apps and websites which is time-consuming and quite annoying. This is often the reason why people decide to give up even from the best trackers. Having a user-friendly design that will allow you a simple and straightforward tracking experience is crucial. When it comes to choosing a tracking device, we all want to have a quality product with a durable battery. Who wants to deal with all that hassle that comes from frequent recharging and battery-replacement? Along with the durable battery, we had to take into account all additional features that every tracker on our list provides. For example, some of them offer maintenance reminders, S. O. S. buttons, while others can track hard braking, speeding, and other activities. We had to assign some additional points to all trackers that provide more features. Last but not least, the price was one of the most important factors in the evaluation. As you already know, tracking devices are expensive little things that require monthly subscriptions, so we wanted to make sure that every one of our picks provides value for the money. What type do you really need? Do you need a small one that you can attach to your pet’s collar, or you need a heavy-duty tracker to accompany you on your adventurous journeys? Maybe you’re up to tracking vehicles, bags, luggage, or other kinds of personal stuff. Think about the things you want to track and how you want to do it, and you’ll know what features you really need for that action. Not all options offer the same features, and not all of them can fulfill your requirements. Think wisely about your specific requirements before you make the final decision! Choosing a perfect tracking device is similar to choosing a perfect phone. It’s just important to have all possible features in order to get a perfect user experience. When it comes to tech stuff, we all want to have intuitive applications that we can handle in a few seconds. Nobody wants a time-consuming app that requires a lot of clicks for a simple action. That’s the thing with trackers as well – the provided app will drastically influence overall experience and satisfaction with the product. Think about that before you make a final decision, and carefully read other customers’ reviews and product’s description. Lastly, we have to admit that the price often guides our decisions. Tracking devices are expensive little tools, and not everyone can afford them. However, there are many decent trackers that offer excellent value, especially if you’re searching for a specific type of tracker. You don’t have to spend a fortune to get accurate GPS information, so think about getting the specially designed device rather than purchasing the ineffective tracker. Q: Is it illegal to use these? A: These are useful tools, but there are laws and regulations you might want to consider before you start using them. For example, it’s completely legal to use a tracking device on your personal stuff. It proves to be very efficient in locating vehicles, luggage, bags, and more. However, it’s illegal to use a tracking device on other people and their belongings. If you intend on using a tracking device, consult local and state laws before you set it up. Q: Why are these better than my phone? A: There are various reasons why a tracking device is more practical than your phone. First and foremost, phones are big devices that efficiently track your location, but they are not designed to track other stuff or other people. Trackers are small devices that easily attach to vehicles, pets’ collars, or perfectly fit in your bags and luggage. They are designed to provide exact locations that you can then read and review from your phone. Q: How can I attach one on a car? A: If you’re using a battery-powered device you can place or attach the device whenever you want. However, many vehicle tracking devices are using the OBDII port located under the dashboard. This way, a tracker continuously works powered by your vehicle, no recharges or battery replacements are required.